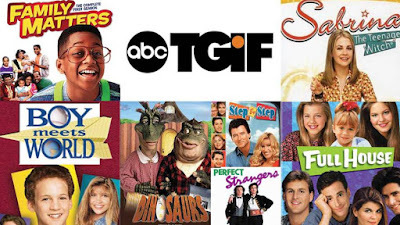 If you grew up in the 90s, then you probably watched TGIF on ABC--a block of sitcoms airing on Friday nights meant to entertain the whole family. If you watched one of the shows, you probably watched them all. 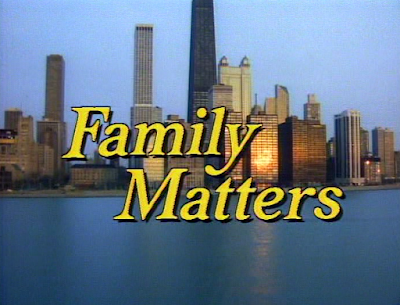 When I think of Family Matters, I still connect the experience to Friday nights. 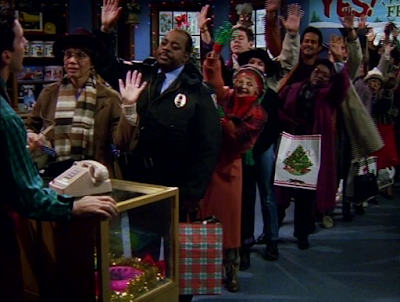 Today may not be Friday, but let me remind you about the first Christmas episode from that series--1990's "Have Yourself a Very Winslow Christmas." 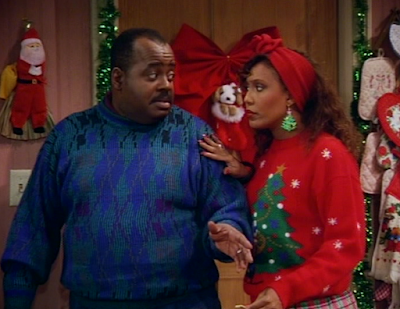 The Winslows are looking forward to Christmas. They all confess that they're most looking forward to a two week break from their annoying neighbor Steve Urkel whose family always takes an out-of-town vacation over the holidays. Before too long, Steve comes over and explains that his parents are going to Hawaii without him this year and he'll be staying with his unusual Uncle Cecil. One reason Laura finds Steve annoying is his unwanted affection. 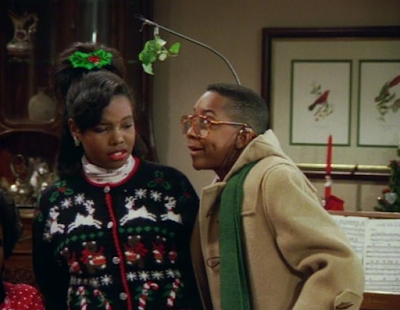 Here, Steve tries to obligate Laura into giving him a kiss under the mistletoe he has rigged to hang above his head. Give it up, Steve! Carl offers to help Rachel. If she looks familiar to you, it may be because actress Telma Hopkins was not new to television in the 1990s. Earlier, Hopkins was on the 1970s Tony Orlando and Dawn variety show (as one of the two Dawn singers). In the 80s, she played Addy on Gimme a Break! and Isabelle on Bosom Buddies. She's done quite a bit of television and film roles since then as well. Meanwhile, Aunt Rachel asks Carl for some help. 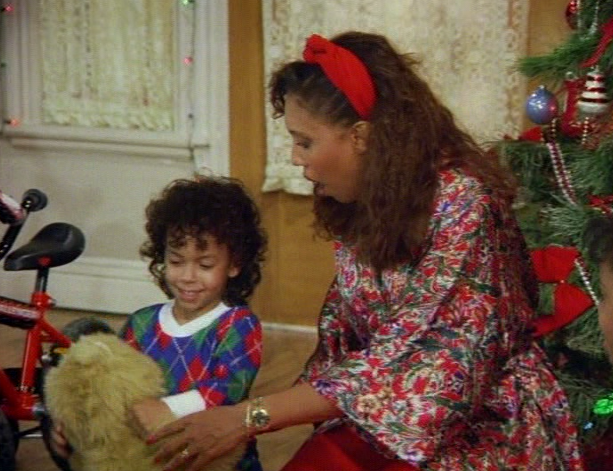 Her young son Richie has his heart set on Santa bringing him a Freddy Teddy--the hottest toy of the season--and she can't find one in any of the stores. Carol promises to help her get a Freddy Teddy to make Richie happy. 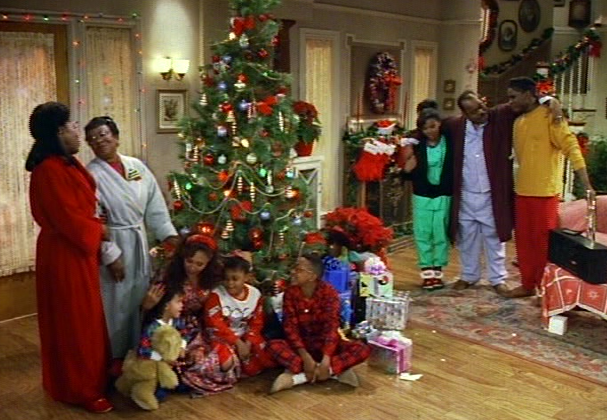 Is there anything more Christmas-y than our favorite TV families decorating the Christmas tree? Later, while decorating the Christmas tree, Eddie and Laura overhear Steve talking to Richie. Steve has promised the little one that Santa will bring him the hard-to-find Freddy Teddy toy. Laura and Eddie confront Steve telling him that he shouldn't make such promises but Steve's faith in Santa is unwavering. 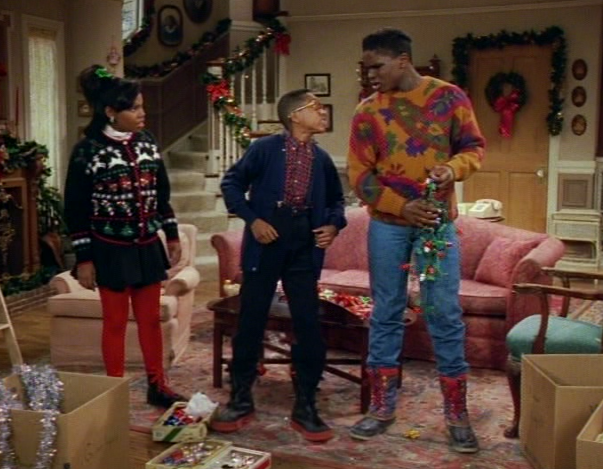 The teenagers are shocked to hear that Steve Urkel still believes in St. Nick. 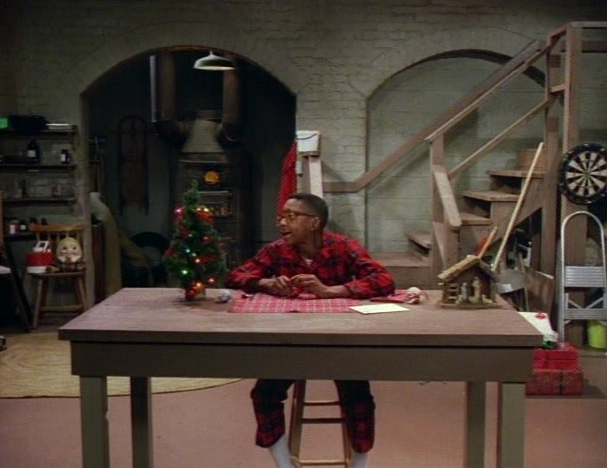 Urkel says he can prove Santa exists--he's going to write a secret letter expressing his Christmas wish and mail it to the Winslows. Then on Christmas day, Laura and Eddie can open the sealed envelope and see that he got exactly what he wished for. Laura and Eddie are angry with Steve for making false promises to their cousin but Steve is frustrated that they don't believe in Santa Claus. As he leaves their house, Steve accidentally trips and knocks down the Christmas tree breaking Laura's favorite ornament. In a fit of anger, Laura tells Steve to never come over their house again! Apologetic, Steve agrees to her demand and offers his absence as his Christmas gift to her. "Who's in line for a Freddy Teddy toy?" Carl drives fifty miles to the nearest store that claims to be selling Freddy Teddy toys. He waits three and half hours in line and is offered the last one in stock! When everyone else in line sees that Carl has the last one, they wrestle it away from him. How will Richie feel on Christmas morning? Harriette knows when something is wrong with Laura. Harriette Winslow speaks to her daughter about something that's bothering her. Laura admits she feels guilty for sending Steve away. Harriette reminds Laura that Steve is frequently accident-prone (there's a reason one of his most oft repeated lines is "Did I do that?). Laura knows she must apologize and she goes to look for him. Steve tries to make the best of a bad situation. When Laura goes to Steve's home, she finds him alone in the basement. Turns out his Uncle Cecil is in jail, leaving Urkel to spend Christmas alone. Not only does Laura apologize to Steve but she invites him to stay with her family for the holidays. Of course, he accepts her offer. Will Laura and Eddie change their minds about Santa? On Christmas morning, the Winslow house is filled with excitement. Richie is thrilled to find his very own Freddy Teddy toy under the tree! Rachel is surprised by this and she begins to thank Carl--but he confesses he didn't get it. Everyone in the room denies getting the toy for Richie but Steve is convinced it came from Santa. 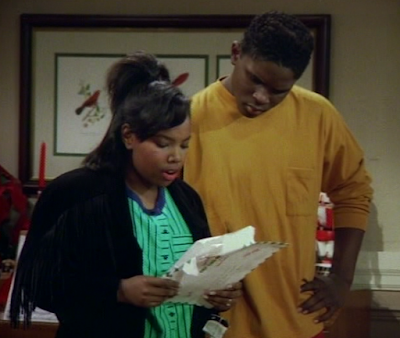 Urkel urges Laura and Eddie to open the sealed envelope he sent in the mail days earlier. 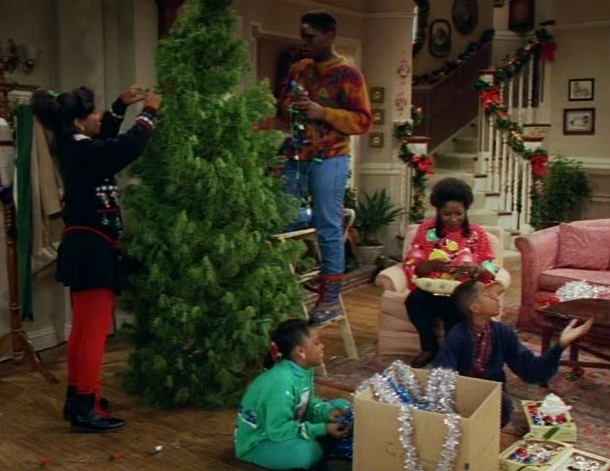 It turns out, Steve had wished for what then had seemed impossible: to spend Christmas with the Winslow family. The Winslow family and Urkel sing "Have Yourself a Merry little Christmas." My favorite part of this episode is the musical moment at the end. Inspired by the spirit of the season, the family sings "Have Yourself a Merry Little Christmas" around the Christmas tree. Although everyone is singing, you can hear Telma Hopkins above some of the others--she has an unmistakable and amazing voice. The Winslows end up singing in all the rest of the series' holiday episodes. I think it's a wonderful Christmas TV tradition. 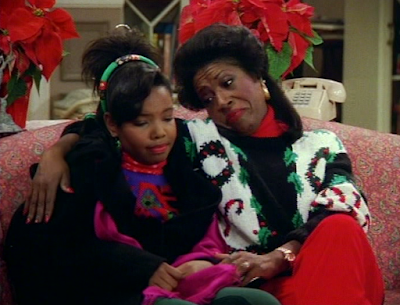 Do you remember other TV families that sing in Christmas episodes? If you're a fan of ABC's TGIF block programming, I've written about several other Christmas episodes from series that ran at one time or another during TGIF. 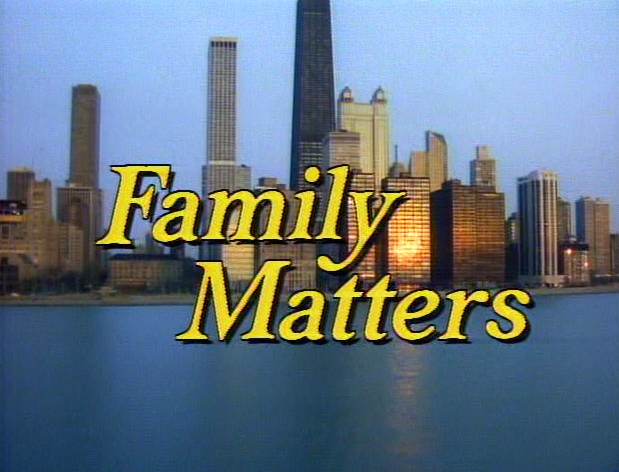 I've previously written here about the 1988 Christmas episode of Perfect Strangers, and the 1988 and the 1994 Christmas episodes of Full House. Click the links to see those discussions again. 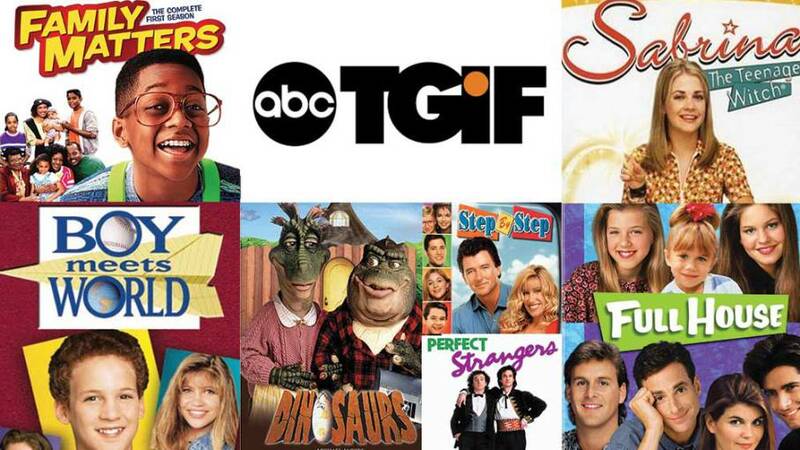 Which were your favorite series airing on TGIF?